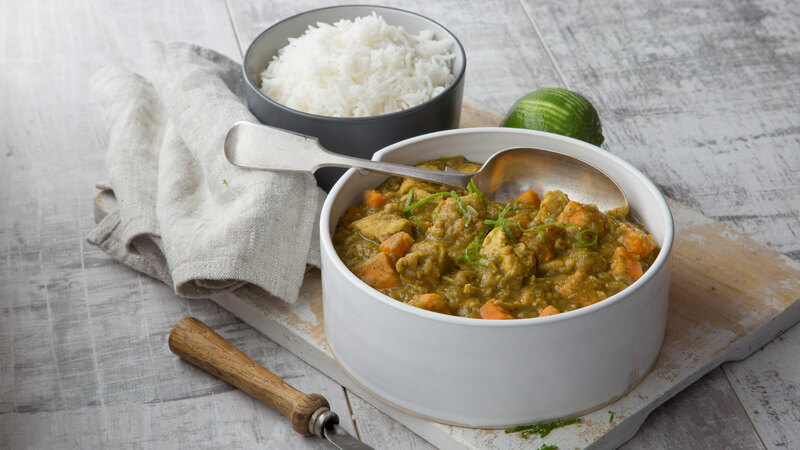 You can make this curry vegetarian by omitting the chicken and replacing the chicken stock with vegetable stock. The dish is still packed with protein from the lentils. 1. Melt the coconut oil in a large pot over a medium heat. Add the onion and carrot and cook for 2 to 3 minutes, until they are starting to soften. Add the garlic and continue to cook, stirring frequently, for another 2 minutes. 2. Add the chicken pieces and cook for 3 to 4 minutes, until lightly coloured. Add the lentils, sweet potatoes, spices and salt and pepper to taste and stir to combine, then pour in the stock. Bring to the boil, then reduce to a simmer and cook for 25 minutes, until the lentils and sweet potatoes are tender. 3. Meanwhile, cook the basmati rice as per the packet instructions. Keep warm until needed. 4. Stir in the coconut milk and simmer for a further 5 minutes. Check the seasoning and add the lime zest. Serve immediately ladled over the basmati rice. Have made this curry several times. So easy to prep and absolutely delicious . Red lentils and sweet potatoes make it really wholesome. Even nicer when left overnight.